Madrid searched for an equaliser but, despite hitting the woodwork three times, were resisted by a determined CSKA defence. 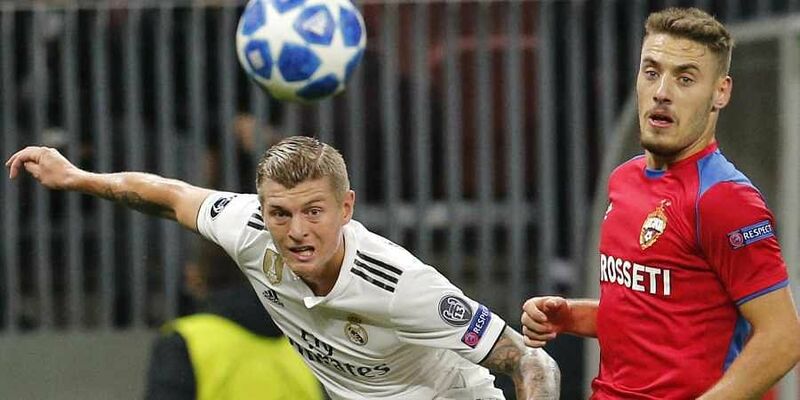 MOSCOW: Toni Kroos' mistake proved costly as Real Madrid's goalscoring problems continued on Tuesday with a surprise 1-0 defeat to CSKA Moscow in the Champions League. Gareth Bale and Sergio Ramos were among a number of key players missing at the Luzhniki Stadium but it was Kroos' dreadful backpass that allowed Nikola Vlasic, on loan from Everton, to put CSKA ahead after just 68 seconds. CSKA's veteran goalkeeper Igor Akinfeev was sent off deep into added time after picking up two yellow cards for dissent but nothing could spoil the hosts' victory. They climb above Madrid in Group G, with Julen Lopetegui's side lacking spark, thrust and cutting edge in attack. They missed Bale, Isco and, perhaps even, the lethal touch of Cristiano Ronaldo. The absence of the established names meant a youthful line-up which included a debut for left-back Sergio Reguilon, the 21-year-old who has been with the club's academy since the age of eight. Madrid hardly troubled CSKA during the first half even if Casemiro's long-range shot clipped the outside of the post and Karim Benzema's header plopped off the top of the crossbar. Mariano Diaz and Modric finally came on for Casemiro and Vazquez shortly before the hour but even FIFA's best player in the world was unable to engineer any penetration through midfield. Mariano headed Ceballos' cross onto the post for one final chance but Madrid could hardly complain.